What's with the weird brush strokes or whatever at thee right? Don't be so hasty, missy. You may be my Oyakata-sama but you still have much to learn. well a great wallpaper again.+fav! I have no complaints about anything. The vector is gorgeous, the light falls perfectly and the simple background fits them. Oh well, it's pretty anyway, although I have to point out that your recent walls have very small resolution ._. Nice job on adding some deeper shading compared to screenshot. Cool, I like it a lot. Thanks. That's gorgeous. I love the colors of the sunset. It's so pretty. OMG i love it sooooooooo much! This is a good wallpaper you made. I like this scene from inuyasha. 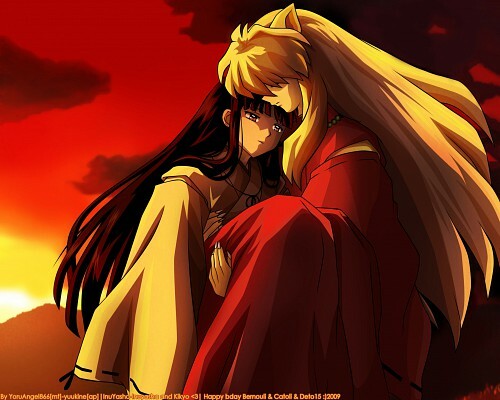 Sad that Kikyo died.